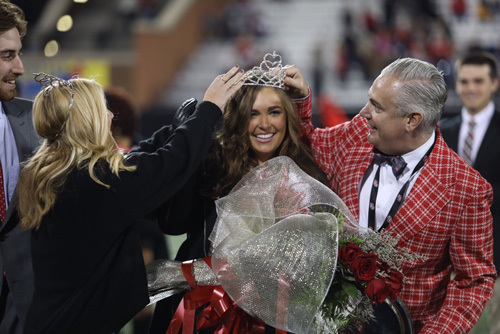 Makayle Botts of Glasgow was crowned WKU’s 2018 Homecoming queen on Saturday (Oct. 27). Botts, the daughter of Jimmy and Cathy Botts, is a Public Relations major and Communication Studies minor and was sponsored by Alpha Omicron Pi and Sigma Phi Epsilon. She was one of 22 candidates for Homecoming queen. First runner-up was Corinne Warlick of Louisville, daughter of Josh and Liz Warlick. She is a Chemistry major and was sponsored by HonorsToppers. Second runner-up was Maggie Flanagan of Russell Springs, daughter of Melanie Flanagan. She is a Nursing major and was sponsored by Alpha Xi Delta and Sigma Nu.